In this chapter, we present new adaptive schemes for uncertain nonlinear systems preceded by unknown dead-zone nonlinearity. 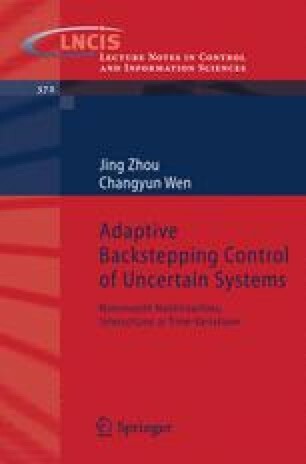 Robust adaptive backstepping control algorithms are developed for state feedback tracking of a class of uncertain dynamic nonlinear systems preceded by unknown dead-zone nonlinearities, in the presence of bounded external disturbances. Output feedback tracking is also considered and this is achieved by introducing a new smooth inverse function of the dead-zone and using it in the controller design with backstepping technique. For the design and implementation of the controllers, no knowledge is assumed on the unknown system parameters and also the dead-zone. It is shown that the proposed controllers not only can guarantee stability, but also transient performance.